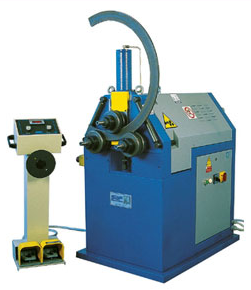 The machine can be positioned both vertically or horizontally. This feature means that it can be easily adapted for bending any profile with any bending radius. There are options for short or long shafts, and shaft supports. It is supplied with a set of universal rolls. 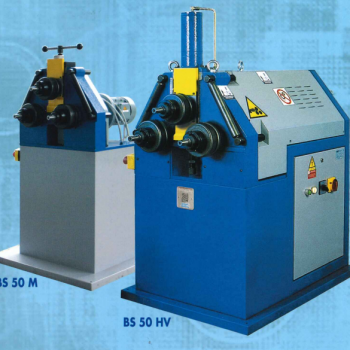 The Saf BS 50 is a pyramid style ring rolling machine, two shafts are gear driven and manufactured from hardened and grounded strength steel. This machine can be supplied with a mechanical top roll positioner BS 50M or a hydraulic cylinder and mechanical stop BS 50 HV for the top roll. The manual version comes complete with rolls and tools that are easy to use and operator friendly. There is a digital readout to help visualise the bending roll positions. The hydraulic version has a electronic quote positioner and mechanical screw lock to give a more accurate and repeatable position.